Constellation Ursa Minor the the Little Bear, is a northern constellation sitting under constellation Draco, between constellation Cepheus and constellation Ursa Major. Ursa Minor spans 40 degrees of the Zodiac in the Signs of Gemini, Cancer and Leo, and contains 8 named fixed stars. 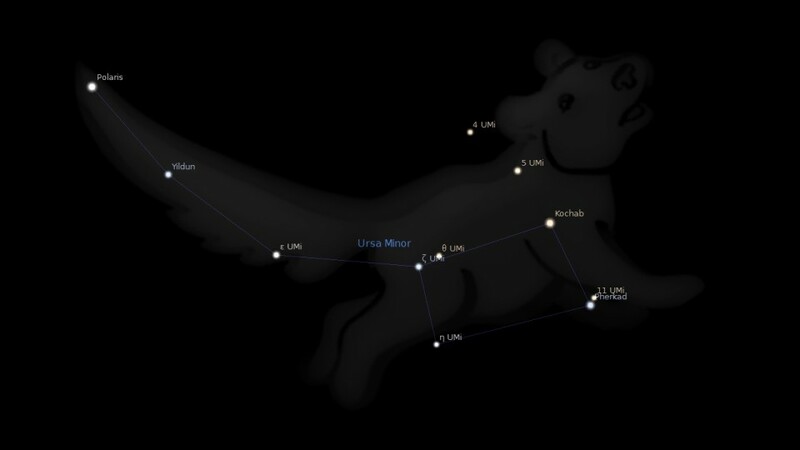 According to some accounts this constellation, Ursa Minor, represents Arcas, son of Callisto and Jupiter. Other writers state that it is meant to represent Cynosura, one of the Nymphs of Crete who reared the infant Jupiter; the other, Helice, being Ursa Major. Cox identified the word with Aukosoura, which he renders Tail, or Train, of Light. Yet this does not seem appropriate to a comparatively faint constellation, and would rather recall the city of that title in Arcadia, the country so intimately connected with the Bears. But the stellar name probably long antedated the geographical, old as this was; Pausanias considering Lycosura the most ancient city in the world, having been founded by Lycaon (Lupus) some time before the Deluge of Deucalion. Indeed the Arcadians asserted that they and their country antedated the creation of the moon, an assertion which gave occasion to Aristotle’s term for them, — Proselenoi and the Latins’ Proselenes. Singularly coincident with the foregoing Aukosoura was the title that the distant Gaels gave to these stars, — Drag-blod, the Fire Tail. Very recently, however, Brown has suggested that the word is not Hellenic in origin, but Euphratean; -and, in confirmation of this, mentions a constellation title from that valley, transcribed by Sayce as An-ta-sur-ra, the Upper Sphere. Brown reads this An-nas-sur-ra, High in Rising, certainly very appropriate to Ursa Minor; and he compares it with K-uv-os, or, the initial consonant being omitted, Unosoura. This, singularly like the Euphratean original, “might easily become Kunosoura under the influence of a popular etymology, aided by the appearance of the tail stars of the constellation. Ursa Minor was not mentioned by Homer or Hesiod, for, according to Strabo, it was not admitted among the constellations of the Greeks until about 600 B.C., when Thales, inspired by its use in Phoenicia, his probable birthplace, suggested it to the Greek mariners in place of its greater neighbor, which till then had been their sailing guide. Aratos, comparing the two, wrote, as in our motto, of the Minor, its Guards, beta and gamma, then being much nearer the pole than was alpha, our present pole-star. Thales is reported to have formed it by utilizing the ancient wings of Draco, perceiving that the seven chief components somewhat resembled the well-known Wain, but reversed with respect to each other. From all this come its titles Phoinike, Phoenice, and Ursa Phoenicia [these words should relate to the constellation Phoenix, and the related word Phoenician; the Phoenician mariners used Polaris as their guiding star]. Here, and in Ursa Major, some early commentators located the Fold, an ancient stellar figure of the Arabs, and an appropriate title, as Firuzabadi called beta and the gammas in Ursa Minor Al Farkadain, usually rendered the Two Calves, but, better, the Two Young Ibexes; Polaris, too, was well known as a Young He Goat, and adjacent stars bore names of desert animals more or less associated with a fold. Now where heaven reaches its culmination in the shining Bears, which from the summit of the sky look down on all the stars and know no setting and, shifting their opposed stations about the same high point, set sky and stars in rotation, from there an insubstantial axis runs down through the wintry air and controls the universe, keeping it pivoted at opposite poles: it forms the middle about which the starry sphere revolves and wheels its heavenly flight, but is itself without motion and, drawn straight through the empty spaces of the great sky to the two Bears and through the very globe of the Earth, stands fixed, since the entire atmosphere ever revolves in a circle, and every part of the whole rotates to the place from which it once began, that which is in the middle, about which all moves, so insubstantial that it cannot turn round upon itself or even submit to motion or spin in circular fashion, this men have called the axis, since, motionless itself, it yet sees everything spinning about it. The top of the axis is occupied by constellations well known to hapless mariners, guiding them over the measureless deep in their search for gain. Helice, the greater, describes the greater arc; it is marked by seven stars which vie with each other under its guidance the ships of Greece set sail to cross the seas. “Cynosura is small and wheels round in a narrow circle, less in brightness as it is in size, but in the judgment of the Tyrians it excels the larger bear. It is sufficient to point to the fact that no Bear is found in any Chaldean, Egyptian, Pesian, or Indian Zodiacs, and that no bear was ever seen with such a tail! 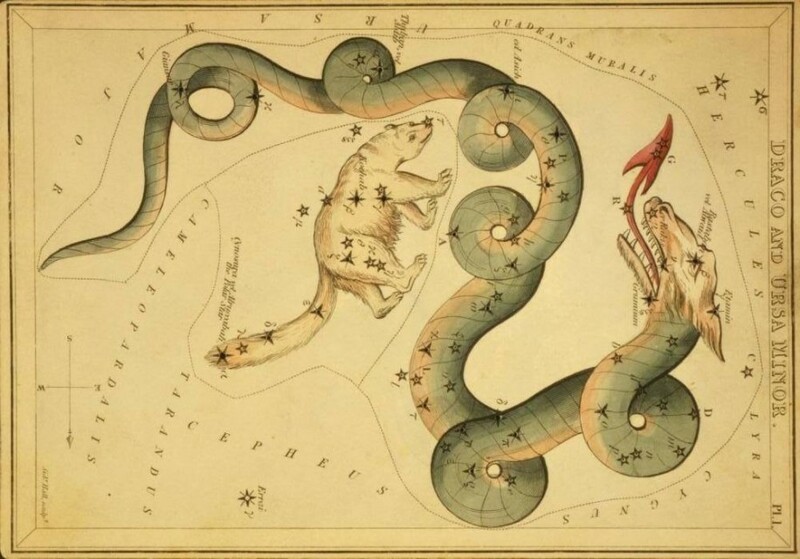 No one who had ever seen a bear would have called attention to a tail, such as no bear ever had, by placing in its very tip the most important, wondrous, and mysterious Polar Star, the central star of the heavens, round which all others revolve. The patriarchal astronomers, we may be sure, committed no such folly as this. Here are the two Sheepfolds, then; the Greater fold, and Lesser; and here is the rest and security which the flocks will find therein. But in Hebrew there is a word very similar in sound, though not in spelling–dohv, which means a bear! So we find in Arabic dub; Persian, deeb and dob. We can see, therefore, how the Hebrew Dohver, a fold, and Dohv, a bear, were confused; and how the Arabic Dubah, cattle, might easily have been mistaken by the Greeks, and understood as a bear. The constellation, which we must therefore call THE LESSER SHEEPFOLD, contains 24 stars, viz., one of the 2nd magnitude, two of the 3rd, four of the 4th, etc. The brightest star, α (at the point of the tail), is the most important in the whole heavens. It is named Al Ruccaba, which means the turned or ridden on, and is today the Polar or central star, which does not revolve in a circle as does every other star, but remains, apparently, fixed in its position. But though the star does not revolve like the others, the central point in the heavens is very slowly but steadily moving. When these constellations were formed the Dragon possessed this important point, and the star a, in Draco, marked this central point. But, by its gradual recession, that point is sufficiently near this star Ruccaba, in the Lesser Sheepfold, for it to be what is called “the Polar Star.” But, how could this have been known five or six thousand years ago? How could it have been known when it received its name, which means the turned or ridden on? That it was known is clear: so likewise was it made known in the written Word that the original blessing included not merely the multiplicaiton of the seed of faithful Abraham, but it was then added, “And thy seed shall possess the gate of his enemies” (Gen 22:17). This star was called by the Greeks the “Cynosure.” ARATUS seems to apply this term to the whole of the seven stars of the Lesser Bear. Mr. Robert Brown, Jr., shows that this word once supposed to be Hellenic, is non-Hellenic, and possibly Euphratean in origin, from a word which he transliterates An-nas-sur-ra, and renders it, “as it literally means, high in rising, i.e., in heavenly position.” (Euphratean Stellar Researches). Is not this the primitve truth of the Revelation? Will not this Lesser Fold be high, yea, the highest in heavenly position? 1. Fixed Stars and Constellations in Astrology, Vivian E. Robson, 1923, p.65-66. 2. Star Names: Their Lore and Meaning, Richard H. Allen, 1889, p.447-453. 3. Astronomica, Manilius, 1st century AD, p.27. 4. The Witness of the Stars, E. W. Bullinger, 36. Ursa Minor (the Little Bear).